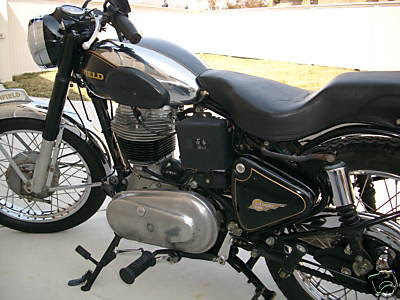 A 2000 Royal Enfield Bullet Deluxe is on sale on eBay in Milwaukee, Wis. The bike has only two little problems, according to the owner: a small tear in the seat and "the blinkers rattled off after a few miles (I still have them, but they are in pieces)." In my experience, the missing turn signals are no surprise. As he delivered my shiny new Royal Enfield Bullet, my dealer pointed to the turn signals and mentioned, "you know, we do sell nice replacements for those." I considered it a moment, remembering that I had dropped a motorcycle twice (once on each side) during motorcycle training class. "Well, let me knock these off first!" I replied. Luckily, I haven't dropped my Bullet, but the turn signals came off anyway, in the course of 40,000 miles. The plastic stalks snapped. Maybe vibration was to blame but I really think the the stalks just reverted back to their origin as soybeans or recycled refrigerator cartons. They seemed to become brittle with age; you can crumble the originals from mine with your fingers. The big (some say ugly) turn signals are required by U.S. road regulations, but once they're in the hands of owners many are replaced with more tasteful looking items. If the used bike you're considering comes with after-market blinkers you probably should consider that a definite improvement. Royal Enfield no doubt thought the original turn signals an inexpensive way to meet regulations, in the realization that many would get replaced anyway. But they did let down the character of the bike, which is otherwise largely Made of Metal, and proud of it.